Forest canopies play a significant role in regulating carbon and water exchanges with the atmosphere, with profound effects on our climate. However, their role in altering the chemical composition of precipitation and, consequently, the nutrient cycling within a forest has been less investigated. This is particular relevant for N-limited forests in the Northern hemisphere, which have been exposed to a rapid human- induced increase in N deposition over the last decades. Much of the scientific attention has been focused on the role of N deposition in enhancing forest C-sink, while we still need to elucidate the fate of N deposition when entering forest and its contribution to N cycling. In particular, it is still not clear whether N deposition is retained, taken up and/or altered by biological transformations when interacting with tree canopies. By applying a quadruple isotope approach I demonstrated the occurrence of in-canopy biological nitrification of atmospheric N for UK forests at high N deposition. Hence, NITRIPHYLL intends to extend the multiple isotopes approach a) to enlarge the range of conditions under which the process is demonstrated to occur, b) to investigate difference between species in the proportion of microbiologically-derived NO3 and c) the reasons of these differences. Furthermore, by using meta-barcoding and qPCR techniques we aim to characterize phyllosphere microbial communities involved in canopy nitrification. ​The project had an European dimension, as I consider forests within the ICP forests network or Country-based long-term monitoring program (e.g., La Castaña, LC, in Spain). Sites were chosen along a climate and N deposition gradient from Fennoscandia to the Mediterranean area (see map). We also included an existing N manipulation experiment where N has been added in the soil and over tree canopies. NITRIPHYLL for the first time merged two separate research avenues, i.e., the investigation of canopy nitrification with the study of the occurrence, abundance and diversity of microbial communities in the phyllosphere. What have we learned from the project so far? Preliminary analyses on data suggest that: i) phyllosphere hosts incredibly diverse bacterial communities, with difference in the structure and composition, between the investigated species; ii) if we zoom to N-related species, we found nitrifiers to be present in the phyllosphere, and iii) their activity was detected by using Δ17O. More analyses will be carried out to explore differences among sites/species and sample type (soil, foliar and water samples) and whether they are related to climate and N deposition. NITRIPHYLL aimed to challenge the paradigm that microbial communities involved in forest N cycling are limited to the rhizosphere and hence that N deposition is exclusively processed in the soil. 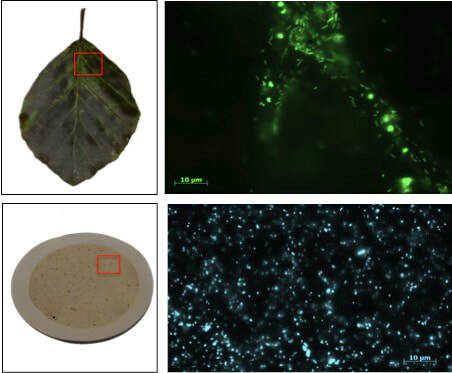 Furthermore, it aimed to prove that the microbial communities harbored in forest canopies carry out processes hitherto unrecognized for their significance, i.e., nitrification in the canopy, thereby helping cycling N before litter is returned to the soil. Below you can read specific goals and preliminary results -- still working on the data! Processing through anion resins RF and TF water samples collected at the UK sites. GOAL 1. To extend the multiple isotope approach and in particular the Δ17O tracer to different EU forests, to depict the occurrence of canopy nitrification along broad N deposition and climate gradients. To achieve this goal, raingall (RF) and throughfall (TF) water collected at all the sites --and over multiple sampling dates-- were first filtered, and then passed through anion resins to trap NO3. Resin containing NO3 were then prepared for the measure of δ15N, δ18O and δ17O in NO3. Moreover, we are using the Δ17O in TF NO3 to quantify the fraction of atmospherically-derived NO3 (Δ17Oatm > 0 per mille (‰) due to an enrichment in 17O during photochemical oxidization of nitrogen oxides (NOx) by O3) and microbiologically-derived NO3 − (Δ17O from nitrification = 0‰). Data we have analyzed so far (i.e., at LC) provide isotopic evidence of NO3- derived from nitrification in the canopies of holm oak trees in August (about 20%), after a severe drought, and to a lesser extent in September, and atmospheric deposition was the dominant source of NO3- for October-December (Guerrieri et al. 2018, in preparation for submission to Global Change Biology). Microbial DNA was collected from foliar surface, filters used to filter water samples, and from soil. The DNA was then sequenced using an Illumina MiSeq instrument. Over a million of reads were obtained, which were processed through bioinformatics pipeline to obtain the final table, i.e. OTU table, with the classification of microbes (including bacteria and archaea) present in our samples. We also conducted observation under the microscope to see the incredible life hidden in water and foliar samples. I was amazed to see how microbes locate themselves along the leaf nerves! Preliminary analyses indicate that the structure and composition of microbial communities differ among the sample types. Within foliar samples, differences in microbial communities were also observed between tree species considered. Number of copies of amoA for bacteria (AOA) and Archaea (AOA) on foliar samples. Different colors indicate Scots pine (light blue) and beech (light red). Guerrieri et al. in preparation. Isotope data provided indication of nitrification occurring in tree canopies, but who is responsible for it? 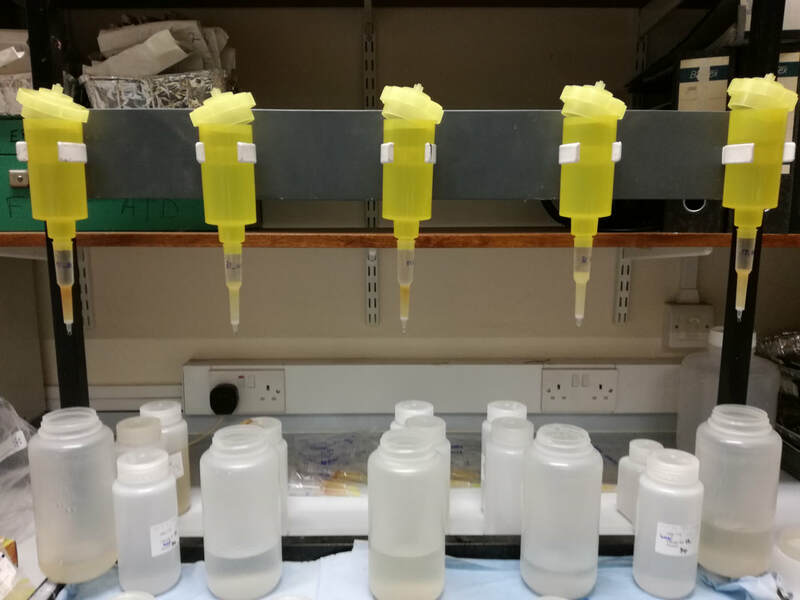 Using quantitative PCR (qPCR) we quantified number of copies of the amoA, the functional gene involved in the first step of nitrification and present in ammonia-oxidizing bacteria (AOB) and ammonia-oxidizing Achaea (AOA). Both were present across all samples (foliar,soil and RF/TF water), with archaeal nitrifiers being generally more abundant than bacterial nitrifiers. This was particularly true for the phyllosphere, as at some sites it was challenging detecting AOB, at least in the samples we collected. enjoy some photos of the forest sites, sampling and lab work! ​Greg Michalski , who developed the theoretical understanding and technic to measure d17O in nitrate.